We leave Leh in the morning for Lamayuru by jeep. Along the way, we will come across some of the oldest and most famous monasteries in Ladakh. The monasteries in Lamayuru, Likir and Alchi are truly worth visiting for their age and history. 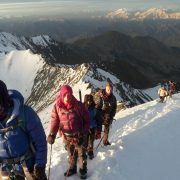 After reaching Phanjila we will camp overnight. Today we will start the first day of our long trek. After a short walk from Phanjila the valley becomes more and more narrow, leading into a spectacular gorge with rock walls rising 1000m above the river. The Zanskar River makes its way deep down in the gorge, and in this barren, harsh landscape beautiful rosebushes flower. We will camp close to the river just after the village of Hanupatta (3760m), from where we have a great view down the valley. We follow the wide Spong Valley up for some time before we cross the river and start on the long and gradual ascent to Sir Sir la (4850m). From the top of the pass there are great views of the main Zanskar range as well as our next pass, Singge la (5090m). It is another 2 ½ hours walk down to the village of Photoksar (4200m), enclosed in green fields and situated among mountain cliffs. The trail towards Sumdo disappears in the deep gorge down to the right of the village. We make our comfortable camp for the night close to the village and enjoy a well-deserved rest. After crossing the small pass of Bumiktse la (4200), we enter into the broad and lush Photang valley. A gentle trail leads us through this enjoyable landscape, where the villagers keep their yaks and horses grazing. 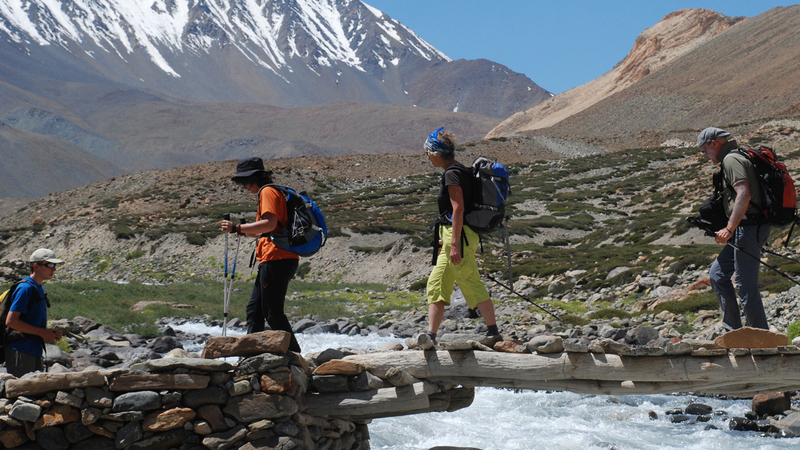 One of the most fascinating things about the Zanskar trek is the ever-changing landscape. Every time you turn a corner or cross a pass, a new world will appear in front of you: the deepest gorges, the greenest fields, the majestic Zanskar River giving formations and life. Slowly we ascend towards our camp at the base of Singe la (4600 m). The last few hundred meters are steep, but the top of the pass presents a rewarding view. From the pass a steep descend for few hundred meters. We follow the trail high above the Zanskar River, the mountains having taken a greener and gentler formation, before ascending gradually to Kiupa la (4400 m). From the pass the trail down is steep zigzag to the village of Gongma (3840m). From Gongma we climb up the gentle trail to the Margum la (4400m) from where we can see Lingshed an hour or so away. The monastery is founded by the Gelugpa order and gives home to around 60 monks. The village itself is spread out over a big area, enclosed in green fields of barley. After visiting monastery of Lingshed we will continue towards Lanang. A steep and long ascent will take us to the pass of Hanumur la (4950m). Once there, the views north to Singe la and the snowcapped peaks of the Ladakh range are spectacular. From the pass it is an easy descend for an hour before a steep descend down to Snertse. Just above Snertse, there is a herders’ camp, and sometimes fresh cheese, milk and curd are available here. Down in the riverbed it’s possible to go hunting for fossils, and the locals sometimes show a nice collection of what they have found. When the Indian plate slammed into the stationary mass of Asia some 50 millions years ago, the Great Himalayas were formed. The Zanskar range consists of layers of sediments from the ocean floor while the Ladakh range consists of granite, born in the immense heat generated by the friction between the two plates. 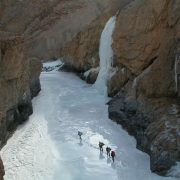 After resting for a while at Snertse we will continue towards Zingchen, where we can take a bath in Oma Chhu river. In the early morning we head for our last pass before Padum, Parfi la (3950m), juniper covered trail zigzagging up to the pass. This area is also home to the Himalayan brown bear, as well as blue sheep. From the pass we descend down to the banks of the Zanskar River and to the village of Hanamur (3380m), which will be our camp for tonight. This is a relatively level stage along the Zanskar River. On the way we will pass Pidmo (3420m), a small village with a few families. It is another 2-3 hours journey to Pishu, (3470m) which is a scenic village located on the west side of the Zanskar River. Hanamur, Pishu and Pidmo together with Tsazar and Honia on the other side of the river, constituted the former kingdom of Zangla. The entrance to Pidmo is marked by a long mani wall and chortens, from where we find our way to a grassy campsite. We have another quite easy day ahead of us along a dry, dusty jeep road. From Pishu the trail leads to Rinam (3550 m), following the banks of the Zanskar River. Arriving at Karsha (3600m) we can visit the famous monastery. Karsha monastery is one of largest monasteries of the Gelukpa sect, founded around the 10th century A.D. and with 140 resident monks. It is situated on a hillside with an impressive view of the entire valley. After visiting the monastery we continue towards Padum (3531m), the capital of Zanskar and a major trade center in the valley. We will follow a dusty jeep road until Raru, which has been built recently, passing by the villages of Shila and Bardan, the last one being well known for its monastery as well as for its huge and beautifully engraved prayer wheels. 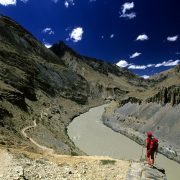 From Bardhan it will take another couple of hrs along the Tsarap River before entering a plateau and the village and monastery of Mune. It is another 40 min walk to our camp at Raru (3900 m). From Raru the trail follows a flat ground before descending steeply to the banks of the Tsarap River. Thereafter the trail follows the river leading to our camp at Pepula (3850 m). From Pepula the trail can at places be quite tricky for the horses. Along the trail there are many ups and downs, and we will cross some small side rivers leading to the villages of Surle and Char. 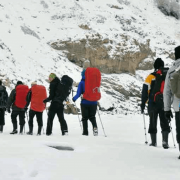 We follow the valley to the confluence of the Tsarap and Kargyak Rivers, and will then cross a bridge and climb up to the village of Purne (3700m), where we will find our campsite. Phuktal monastery is the most spectacular situated gompa in Ladakh, clinging to some limestone cliffs with the main assembly hall carved out of a huge cave and with the monks’ white residences scattered down the hillside. The monastery belongs to the Gelukpa order (yellow hat order) and is built around a sacred spring which flows all year, even in the winter when other springs freeze. Inside the monastery there is an inscription to Cosma de Koros (Hungarian historian), one of the first Europeans to visit the Zanskar region and the first to translate the Buddhist texts from Tibetan into English. After visiting the monastery we’ll return to Purne to spend the night. We recross the bridge across the Kargyak River in the morning and follow the trail to the settlement of Yal. A steep ascent then leads us to the huge, fertile plateau of the whitewashed village of Tetha (3950), where we will find our campsite. It is a gentle walk today and we soon enter the village of Karu, marked by chortens. Stone walls line the track, protecting the fields from pack animals. 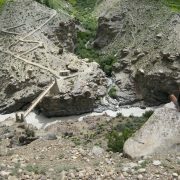 Below the village of Tanze, we cross the bridge, and from here it is another 5km to the village of Kargyak, (4050m) the highest permanent settlement in the Zanskar region. Our campsite for the night will be by the riverbed. In the morning, we walk across yak grazing pastures, with a thick blanket of edelweiss, towards the impressive rock monolith known as the Gumburanjan. Further we will reach the shepherds encampment of Lakang (4470m). Our campsite tonight has great, panoramic views of the Himalaya Range! We start our day with a steep climb, before the trail crosses an alpine tract leading to the base of the Shinkul la. A river crossing over a torrent that flows from the glacier north of the pass will most likely give us wet boots. From here the ascent to Sinkul la (4980m) follows a trail across snowfields or scree, after season. Rock cairns and prayer flags will greet us at the top of the pass and the view is impressive with 6000m peaks defining both the Himalaya and the Baralacha Ranges. From here there is a steep descent to the valley floor. After some time we will reach our camp at Ramjak (4290m). Our trail today leads us through boulder fields, across several streams and meager grazing pastures to Palamo (3600m). We will cross a bridge high above the Darcha River and continue down to the village of Rarig, and at last, Darcha (3350m), our destination. The road is lined by many dhabas and a campsite, and we will from here find our transportation onwards either to Leh or Manali.